This is the quilt so far I have over half of it sewn together. I have done it in sections of 4 blocks together and then added the last row to the square units. The sections of 4 blocks on the left need to be put together and and then I will sew them to the right side that is together I need to add a sashing strip to both sides and across the bottom and then a piano key border around the whole thing. I wish to lay it on the bed it will be going on and see how wide the border strips need to be. Today I have been working on the black sashing on the Sun Bonnet Sue blocks. I have the black on two sides of all the blocks except for the last row I want to sew them all together and then put a full lenght strip on each side. Well except for the top because I was not thinking and sew the strip on the top of each of the block so that strip will be pieced. Sigh! Oh Well I am definitely not perfect. I do like the look after I sew some of the rows together I will snap a new picture. I also got a block done up with a picture of the maker to go on the top. I think it works. We will see how it finals out. Then I am going to take it and lay it on the bed that it will go on and see what lenght I want the piano key border on the quilt. No idea where the month went but it sure did fly by. I been busy in Feb working on a fund raiser event for the local Opera House. That went well. I am not back to my sewing room and working on a farmers wife block. Need to get back into that grove I fell behind on the group's goals oh well it will get done as it gets done. 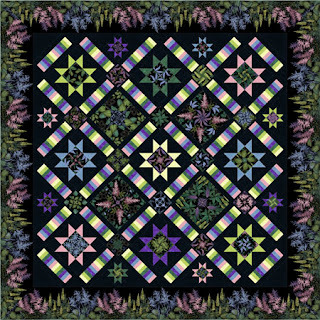 I will be going to a class sponsored by our guild NEIQG for a quilt design by Quilt Moments and the pattern's name is Twilight Kaleidoscope I need to decided on the border print and from there what the quilt will be. 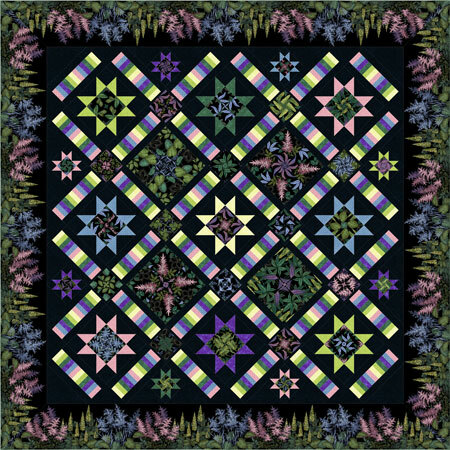 The designer has some beautiful quilts on her sight that I do really like. Though why I am starting a new project I am not sure.